Decorate for Halloween With Flowers! Decorating for the holidays is always a fun idea but it requires so much time and energy. First, numerous hours (and dollars) are spent at the store searching for the right decorations. Then more time is used figuring out where to display the new finds and getting everything set up. Then as soon as the holiday is over, everything gets put away into boxes and stored until next year. Who has time for that these days? Of course you want your home to look festive, but surely there is an easier way. That’s why more people are choosing to order fun flower arrangements instead. Ordering a few festive arrangements takes two minutes and they are delivered right to your house! You can choose fall themed arrangements, Halloween themed arrangements, or go with colors that match your current home decor. A festive arrangement makes the perfect centerpiece for a kitchen or dining room table. Order multiple arrangements and display them on your mantle, coffee table, decorative shelves and kitchen counters. Flower arrangements are quick, easy, and bring the fun of the holidays to your home! Don’t put yourself through the daunting task of decorating your home for the holidays. Call a local florist near you. They are experts at design and can create exactly what you are looking for! Research has proven that giving makes us happier than receiving. So why don’t we give gifts more? One reason is because we simply don’t know what to get. Walking through the mall for hours looking for the perfect gift typically leads to disappointment. Avoid the wasted hours and effort with the gift of flowers! As we enter into a new month we have many opportunities to experience the happiness that comes with giving a gift, and flowers never disappoint! This day serves as a reminder of the importance of kindness. We all know people that are facing tough situations or going through challenging times. This day gives us the chance to do something nice for them. Send flowers for encouragement as your nice gesture. Use the hashtag #DoSomethingNice and share what you did on social media. You will feel happy knowing that your act of kindness left a lasting positive impact. 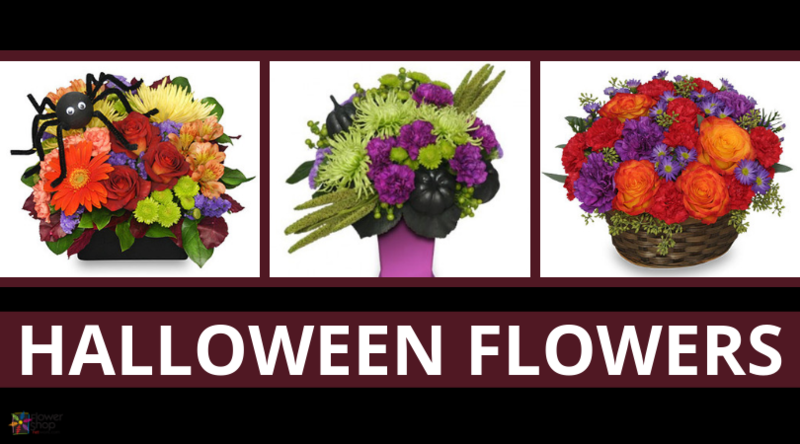 Halloween is almost here, but there’s still time to order flowers! Whether you need them for party decorations or as a gift for your host/hostess, your local florist is ready to make it happen. So walk down to the corner flower shop or give them a call and let them make the prospect of planning your Halloween decorations a little less scary. Your local florist wears many hats. They put together fantastic arrangements, provide knowledge of flowers and their care and they are also a near limitless wellspring of ideas if you are stumped on what kind of arrangement you’d like for your Halloween celebration. Are you thinking of a Halloween themed fairy garden but not sure how it should look? Let your local florist sit down with you to flesh it out. Maybe you’re looking for a way to amp up the spooky atmosphere of your haunted house. Contacting your local florist will give you a flood of ideas and someone to help you implement them. Let your Halloween decorations will take on new life. Contact your local florist for some fantastic Halloween themed arrangements. What do costumes, apples and ghouls have in common? Halloween. I know. I gave you that one. In any case, Halloween is a very festive time when even the most straight-laced folks get to let loose and enjoy the evening. It’s the only time of year when no one thinks twice about seeing Batman walk down the street beside an angel and a skeleton. Kind of creepy, yes, but Halloween is a popular holiday for a reason—the gifts! Halloween gifts range from gag gifts to Halloween flower arrangements. When boo-tiful blossoms are the gift of choice, the hard part becomes figuring out what clever lines to leave on the enclosure card. I’ll help you out again. Local florists spend Halloween like everyone else except they get to deliver their best Halloween flower arrangements and watch how happy this type of celebration makes people. They are always coming across new and clever card messages to accompany their arrangements, so it seemed only natural to ask for some of their favorite Halloween card messages. Surprise! That’s only 7! Find all 10 Halloween enclosure card messages. Feel free to share this frighteningly funny list with your customers. Let us know who BOO!-hooed and who laughed hysterically. Brought to you by Flower Shop Network. Bibbity Bobbity Blooms! Still Time For Enchanting Flowers. Our favorite bewitching holiday is just a few days away. And you don’t need a fancy wand to stir up some magic for this Halloween! Sending flowers will add some sparkle to a fun night and make for some perfectly fang-tastic smiles! Whether it’s a beautiful centerpiece at the party or just saying “Boo!” to a friend, send some big colorful blooms to make your night of tricks and treats all the more magical. Going to a party? Flowers are the best hostess gifts! Candy bouquets are perfect for making Halloween special to someone you want to keep near and dear. Order today and still have time to make sure that Halloween is truly enchanting this Thursday. Have a frightfully good Halloween and remember to dig up your real local florist for all your orders.